Friday, April 5, 2013 Write a thank you note to the earth or Mother Nature. I hope this post finds you well. 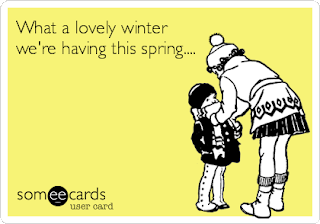 I know you're probably thinking, 'oh great here come the complaints and sarcasm', from the girl who still has snow in her yard (in April). I'm sure you hear enough bitching on a daily basis, so I won't go there. I know eventually you will turn that frown upside down and melt all the snow away. It won't be long before I forget those cold months of winter and find solace once again in my backyard. I look forward to seeing the first glimpse of new shoots breaking through the soil. I am amazed each year when I see my peony bushes grow out of the ground, forgotten is their cold hibernation under the snow. So thank you, Mother Nature, for bringing my yard alive each year, like magic......is what I would have said, if I hadn't woken up to snow again this morning. Ummm....snow again? Really? Oh sure, it isn't a ton of snow, but still! Sorry, it is probably my migraine talking.....which is probably related to this wacky weather....no, no, I'm not blaming you (much). Regards from an on again, off again fan. P.S. Could you get your kids under control (Sandy, Isaac, Katrina....to name but a few). This cracked me up as I am sooooo ready for some Spring weather. I think it is supposed to warm up this weekend here i NYC finally. Yesterday it was 25 degrees in my car at 5:30 am! UGH. I can't wait for the opportunity to get outside in my garden! thats a cute post:) Hopefully warm temp will be there soon.